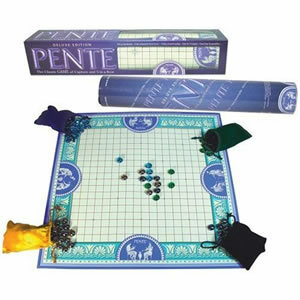 Back when we had an open store in Vermont, Pente was one of the board games we sold and it was quite popular. At that time, the game came in a round tube. It then went out of print for a time. It's a fun game that most folks enjoy, it involves strategic thinking, and it's something to do with others that doesn't involve staring at a video screen, so of course we recommend it.